Lindy has written many cookery books and has been shortlisted for both the Andre Simon and Guild of Food Writers Food Book of the Year. She writes articles on food, cooking and travel. In her new book Raw and Rare, Lindy shares a wealth of ideas for preparing and presenting raw fish, meat, vegetables and fruits. Learn the traditions of cebiche, crudo, sashimi and tartars that have inspired Lindy’s own delicious recipes. There are variations if you prefer them lightly cooked, whether fleetingly applying the searing heat of a griddle, the flame of a blow torch, a waft of hot or cold smoke, a surge of bubbling stock, or a brief encounter with a pickling potion, merely to seal the succulence within. Artisan Drinks celebrates the pleasure to be had from making your own drinks, a pursuit that gets under your skin encouraging you to create more and more. With over 100 recipes for both alcoholic and non-alcoholic drinks, acclaimed cook and food writer Lindy Wildsmith takes you from the freshly harvested ingredients to the finished product in your glass. Along the way, she rediscovers artisanal techniques and takes a wholesome approach to sourcing natural ingredients for infusing, macerating, pressing, brewing and fermenting your own drinks. With clear, step - by - step instructions and beautiful photography from award-winning photographer Kevin Summers, every flavour and nuance is captured. Following a seasonal introduction, Lindy divides the book by style of drink, covering everything from cordials and sparkling drinks, to country wines, beers, ciders and perries, liqueurs and finally tisanes and teas. Find out how to mix and match the drinks you’ve made in celebratory punches and sophisticated cocktails and mocktails. Cicchetti: Delicious Italian Food to Share. Race Point Publishing. Co-written with established food writer and TV cook Valentina Harris. Eat one or twenty one; that’s up to you! Anyone that has strolled around Venice in search of something to eat will surely have come across Cicchetti. They are served in bars, ‘bàcari’ and other eateries and are the Venetian equivalent of tapas; irresistible little snacks of every imaginable configuration. Eat them on sticks at the bar with an ombra (an aperitif), or at a table and on a plate for lunch. This book, as its title might imply, is not only about Cicchetti but about appetisers from all over Italy. Lindy has concentrated on the Cicchetto proper which is uniquely Venetian, whereas Valentina has extended the culinary journey around the regions to share with you some of the finest stuzzichini produced traditionally by friggitori, bars and rosticcerie from Milan to Palermo. She has also written about the regions conjuring up both their culinary and physical characteristics. Join them on this elegant culinary journey. Cured (Salted, spiced, dried, smoked, potted, pickled, raw). As we regress into our culinary past we cannot fail to come face to face with the curer’s crafts. The future of our food must look to the past to ensure its integrity. Cured features all the guidelines, recipes and ingredients any home cook needs to create the intense flavours, textures and colours associated with curing. This is a book specifically written for the home cook and it is not simply about making your own bacon and pancetta. Cured is a collection of new recipes using ancient techniques. A truly global collection of deliciously preserved dishes, they range from New York Deli Pastrami and Native American venison jerky to the Japanese pickled and marinated fish, sashimi and shimi saba. From Europe come smoked salmon and salt beef; French Farm house confit and rillettes; Italian cured fish and meat specialities; and German liverwurst and sauerbraten. From Scandinavia come gravadlax and cured venison. Curing is a fascinating way of creating delicious innovative flavours; no wonder it has become the sport of inventive chefs the world over. It is truly a Slow Food for the future and an ideal craft for the adventurous homecook. Cured has been translated into French by Petit Larousse –‘Larousse des Conserves e Salaisons’. 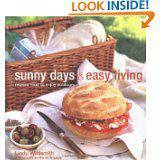 Short listed for Andrew Simon and Guild of Food Writers Awards "Recipe Book of Year 2011"
Sunny Days & Easy Living (previously Eating Outdoors 2006). 2008 – Rylands, Peters and Small. The minute the weather is warm enough, everyone wants to get outdoors. All that fresh air brings on an appetite and food always tastes better when eaten outside. With spring in the air and the sun in the sky, this book is packed full of ideas and recipes for every outdoor occasion. Barbeques, family meals, picnics, elegant al fresco and the all-important drinks to serve in summer. Pasta Sauces. 2004 – Rylands, Peters and Small. 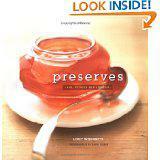 Preserves (Jams, Pickles and Liqueurs). 2004 – Rylands, Peters and Small. For those warm days of late summer and early autumn, when the fruit is ripe and good Cookery books Cichetti, Cured, Eating Outdoors, Pasta Sauces, Preserves by Lindy Wildsmith gives you her inspiring collection of recipes for jams, pickles and liqueurs. Your family will adore them – and if you manage to have some left over you can give them as gifts to friends. Jams, jellies and marmalades are everyone’s favourites. Try red berry jelly, dried apricot conserve or rhubarb and ginger jam. Preserved fruits include peaches in brandy and layered fruits in grappa. Make your own liqueurs for flavouring cakes and puddings or to serve after dinner. Choose from Mediterranean Limoncello and exotic spiced liqueurs. Pickles and chutneys are perfect with cheeses and charcuterie. Try Grannie’s apple chutney or Williamsburg sweet watermelon rind pickle. Enjoy these old-time flavours with these up-to-the-minutes preserves and make summer last all year. 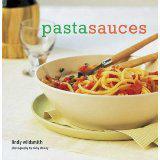 This was Lindy’s first cookery book. 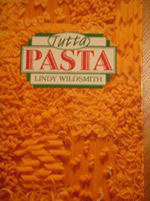 It may look a little outmoded these days with its black and white images but the truth is it is a fascinating, comprehensive and authentic collection of regional Italian pasta dishes Lindy discovered during her seven year stay in Italy. All are accompanied by the traditions and stories associated with them. Learn to make your own sfoglia (homemade pasta) the way Lindy’s culinary mentor, the archetypal Tina Monetti, taught Lindy in Bologna. Then, using the sfoglia make a rotollo di pasta (an Italian pasta roll), filled with meat sauce or spinach and cheese, sliced and then baked in the oven. Discover the intricacies of tortellini or tortelloni and the more down to earth and familiar lasagne and tagliatelle. There are of course plenty of recipes for serving good quality dried pasta for vegetarians and carnivores alike with chapters specialising in vegetable, dairy and meat based dishes. This is a book to read and enjoy that will then inspire you into the kitchen to make the recipes yourself.